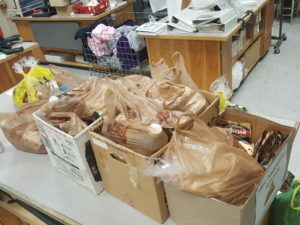 It’s another successful WRVC Food Drive. Thanks to all the students and staff in our 16 programs for the effort and dedication to providing 33 Thanksgiving Day Baskets. Each basket contains; potatoes, squash, canned vegetables, juice, pickles, pumpkin pie filling, gravy, stuffing, cranberry sauce, olives, pie crust, oh, and a turkey. Donations exceeded expectations and the additional canned food will be given to the local food pantry for distribution to those in need after the holiday. The boxes will be delivered to each of the district WRVC serves to be distributed by their school or food pantry. Happy Thanksgiving to all.